Oysters raised on the mud flats of the U.S. Pacific Northwest are prized by restaurants around the country, but starting around 2007, the Pacific oyster population went into crisis. The oysters were hatching, but they weren’t secreting shells quickly enough to protect themselves. Without shells, the young oysters were vulnerable, and large numbers didn’t survive. Biologists traced the problem to changing chemistry in the ocean – the water was becoming more acidic and currents were bringing in water that contained less of a calcium carbonate mineral called aragonite that oysters need to build their shells. “Ocean acidification has been called the evil twin of global warming. It is the other carbon dioxide problem. As we increase the acidity of sea water, it has an effect on organisms,” said Bärbel Hönisch, a biologist and oceanographer at Columbia University’s Lamont-Doherty Earth Observatory. She explains ocean acidification and its effects in more detail in the video above, and discusses how scientists use ancient shells from the sea floor to understand how ocean chemistry has changed over time and could change in the future in the second video, below. Ocean acidification itself is a fairly simple chemical process. As carbon dioxide (CO2) dissolves in water (H2O), it creates carbonic acid (H2CO3), which is a weak acid. Carbonic acid dissociates into hydrogen ions (H+) and bicarbonate ions (HCO3-1), and the hydrogen ions bond with carbonate ions (CO3-2) in the water. In the oceans, many sea creatures with calcium carbonate skeletons and shells also rely on those carbonate ions for aragonite and calcite to build their skeletons and shells. Studies show that as carbon dioxide levels have increased in the atmosphere over the past two centuries, seawater has become less saturated with aragonite and calcite. The average pH of seawater has fallen from about 8.2 to 8.1, about a 30 percent increase in acidity on pH’s logarithmic scale. In the Pacific Northwest, once biologists discovered the source of the oysters’ troubles, they were able to work with oyster growers to develop workarounds to help the oysters grow. Some timed spawning to afternoons, when photosynthetic activity would be higher and more carbon dioxide would be taken up in the water around the hatcheries. By carefully monitoring the acidity of the water brought into the oyster pools, they could also add carbonate to the water as needed and then move the growing oysters to the mud flats after their shells started to form. For other marine life, however, there is no escape from ocean acidification. “Ocean acidification has effects, in the end, for our food chain. We see it in pteropods – tiny marine snails are an important source of food for juvenile Pacific salmon. They are growing thinner shells, and the shells malform under acidified conditions. We see it in sea urchins; in crabs. We see it in a number of organisms that secrete calcium carbon shells; they are having a hard time making their shells,” Hönisch said. Those changes play out in different ways in different parts of the oceans. A global study in 2014 led by Lamont’s Taro Takahashi mapped acidification changes around the world and found the lowest pH levels in the cold waters off Siberia and Alaska, the Pacific Northwest and Antarctica. The scientists found that over extensive ocean areas, excluding the polar regions, pH had been declining by a mean rate of about 0.02 pH units per decade. The concentration of CO2 had been increasing at a rate of about 19 μatm per decade, consistent with the mean increase of 19 ppm per decade in atmospheric CO2 concentration over the past 20 years. 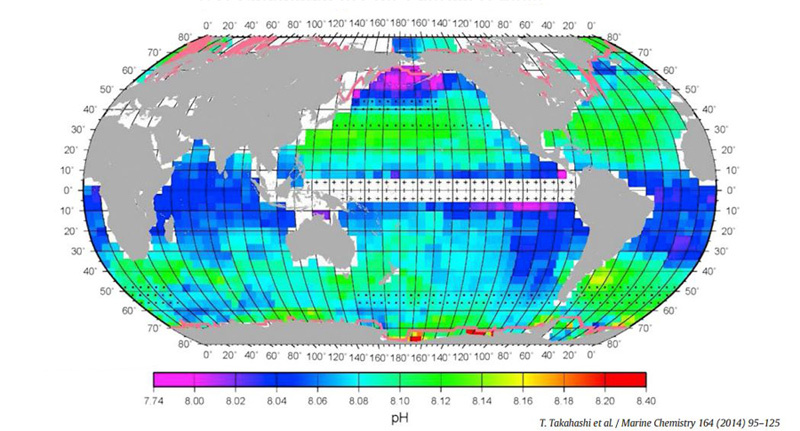 “This suggests that the global oceans are being acidified primarily in response to the atmospheric CO2 increase,” Takahashi and his co-authors write. The National Oceanic and Atmospheric Administration found similar results in 2015, looking specifically at aragonite concentrations. Cold water holds more carbon dioxide, and the scientists found that the Arctic Ocean, northern Pacific and Antarctic waters were acidifying faster than other areas. All of the world’s oceans, from the surface down to 50 meters, are still considered supersaturated with aragonite, but the levels have declined globally, the NOAA study found. At depths down to 100 meters, NOAA found that aragonite saturation had fallen by an average rate of about 0.4 percent per year since 1989. Scientists know from studying deep ocean sediment cores that acidification has wreaked havoc on marine life before. Watch the video below to learn more.